Ah, the day of the eclipse! Time to wander outside with goofy goggles and look at the sun! Over here near Seattle, it was only a partial eclipse — 90% of the sun was covered. I had been pessimistic and thought that perhaps I wouldn’t be able to see it at all because of cloud cover. Silly me! The clouds lifted just as the eclipse began and it was eerie to see how dark everything became. Yet, it was still amazing how much light there still was even with most of the sun covered! My favorite part was probably the dappled light that filtered through the trees — it was all crescents. Anyway, because of the eclipse, I figured I would celebrate with a picture of another eclipse! 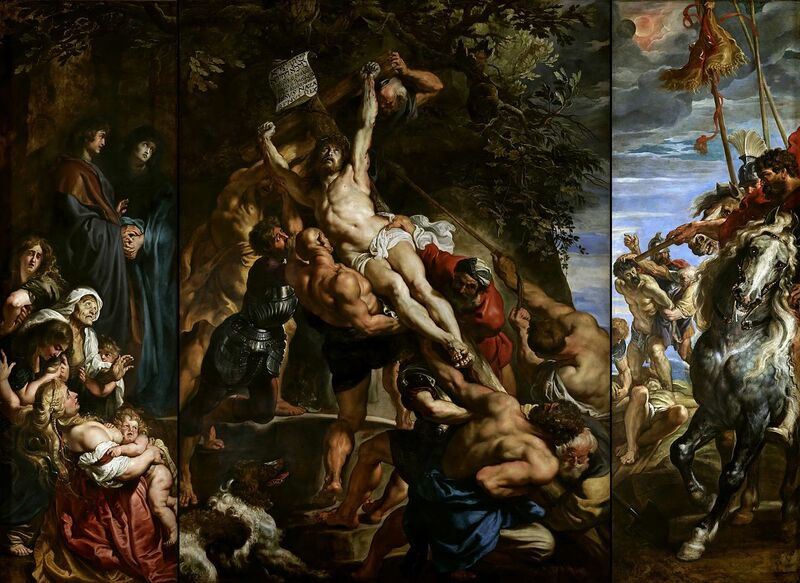 The Elevation of the Cross, by Peter Paul Rubens, c. 1610-11. Cathedral of Our Lady, Antwerp, Belgium. This is a trifecta, or an art piece on three panels. And, on the third panel to the right, you can see the sun starting to get eclipsed by the moon! Did Christ really die during an eclipse? Who knows? But, even if He didn’t, it’s a useful artistic, allegorical device to show that the sun being swallowed up by darkness, just as the Son was swallowed up in darkness through His death. And, just as the earth is temporarily in darkness when the sun is blocked off, so was the earth temporarily in darkness when it had lost the Light of the World. Thank You for being the Light of the World. Also, thanks for making such a cool astronomical display actually occur, thanks to the laws of nature that You enacted as God. That was marvelous!